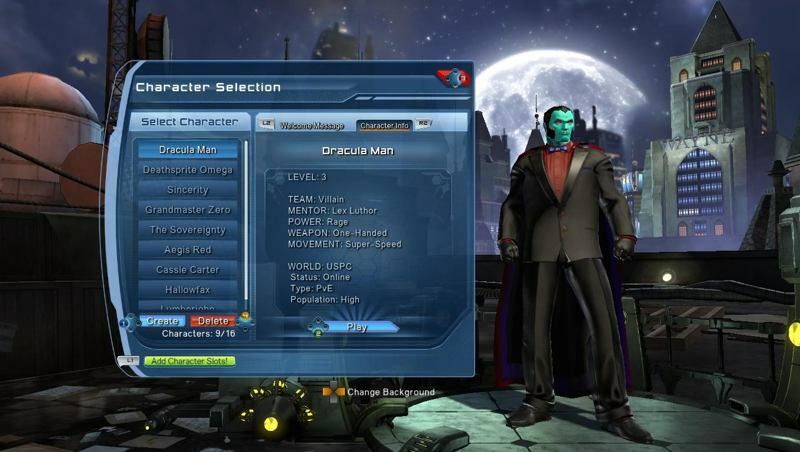 Let me tell you about my latest video game obsession: DC Universe Online. I downloaded it on a whim (it's free-to-play) and it languished in my Steam account for about a month before I got around to trying it. I booted it up and watched the intro video (which is quite good, and sets the tone nicely, giving a somewhat plausible reason why there are thousands of supers running around Metropolis and Gotham all of the sudden). Then it dumped me into the character creation system and, within five minutes, I was grinning like a fool, my eyes wide, as I tinkered and tweaked my first superhero. When I got to Gotham, I started playing around in the actual game and my grin got wider. I could fly. I could shoot magical blasts from my hands and twirl a staff around skillfully. Most importantly (to me, at least), I could continue to tweak and tinker with my character's look, and make him look exactly how I wanted regardless of what gear he had equipped. I was hooked. Since then, I've subscribed to the game. I've made thirteen (!) characters, including a magical gunslinger with a face full of stars, a Winter Soldier knock-off who works for Batman, an angel of death, and a villain named Dracula Man. Yes, he can do whatever a dracula can. I can't remember the last time I had so much fun in an MMO. It's scratching an itch I wasn't even aware I had, and I'm happy to give this (free) game money to keep making me happy.